Abbas claims he doesn't support violence - yet his Fatah and PA have been openly calling nonstop to murder Jews with knives and rocks. Palestinian Authority (PA) Mahmoud Abbas has taken pains to tell the West that he only supports "peaceful resistance," an ongoing wave of calls for terrorism and the murder of Jews by his Fatah faction and his PA government show there is nothing "peaceful" about his vision. 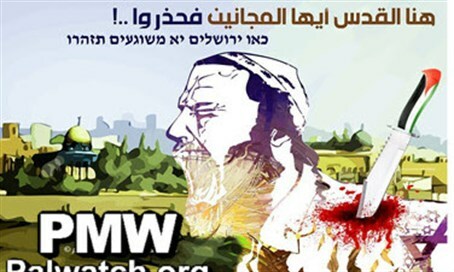 In order to illustrate the depths of the murderous incitement covering the pages of official PA and Fatah media in recent days, Palestinian Media Watch (PMW) on Thursday revealed a retrospective of the incitement since the upswing in attacks began at the start of the month. The first example shows a Jew screaming in pain with a knife colored according to the Palestine Liberation Organization (PLO) flag stabbed into his shoulder. The cartoon was posted on the official Facebook page of Abbas's Fatah faction in early October, at the start of the current wave of attacks. The background shows the Al-Aqsa Mosque and Dome of the Rock on the Temple Mount in Jerusalem, which has served a key role in Abbas's incitement, and the text reads, "here is Jerusalem, you crazies, beware!" Incidentally, "here" in Hebrew was misspelled in the post. Just a few days after the cartoon, and after four Jews had been murdered in shooting and stabbing attacks, Fatah Central Committee member Abbas Zaki justified the unprovoked attacks on civilians to the Turkish Anadolu Agency, in an interview posted on Fatah's European Information and Culture Commission website. "We are defending ourselves today, and will continue to defend ourselves. We are not in favor of escalation. However, the occupation is the one that kills, destroys, and attacks our cities and villages. Of course the defense differs from Palestinian to Palestinian, and there are some among us who defend with a rock, and those who defend with a knife," said Zaki. Regarding rocks, there have been a bevy of cartoons urging Palestinian Arabs to throw the often lethal projectiles at Jews and Jewish motorists. One cartoon published in the official PA paper Al-Hayat Al-Jadida this Sunday shows three children smiling and hurling rocks with slingshots. On the security barrier behind them is written in Arabic: "we will return again" and "Palestine." Yet another cartoon in the PA paper from earlier in the month shows an IDF soldier mockingly caricaturized as he is pummeled by a hail of rocks, accompanied by the text: "winter has returned..."
The incitement was far from limited to the official PA paper. In the Palestinian Arab Al-Ayyam paper, a cartoon was seen last week portraying an entire Arab family of terrorists ready to attack with rocks in their hands. "The rocks of 2015!," reads the text above the cartoon, while on the man's arm is written "Allah is with you, Abu Al-Abed," in reference to the name of a cartoon character. Accompanying the text on his arm is a blue tattoo of a map including all of Israel, from the Jordan River to the Mediterranean Sea. The potentially lethal rock throwing was encouraged in yet another Al-Ayyam cartoon earlier in the month that urged "advance, advance," accompanied by a picture of an Arab terrorist hurling a rock with a PLO flag in the background. Switching back to the official PA daily Al-Hayat Al-Jadida, PMW revealed a cartoon in the image of a PLO flag, in which the flag's triangle is presented as a sharp tip aimed at a bleeding IDF soldier. Various means of "resistance" are depicted, including music, painting, and funeral processions, but presented in prime po‎sition at the forefront is rock throwing. The PA paper also presented a picture of a boy throwing a rock at a bell, possibly indicating a call for more rock attacks so as to cause a noise and attract attention. These numerous examples of incitement, which have accompanied the murder of ten victims in Israel since the start of the month and the wounding of countless others, are only a few prime selections. Another key specimen was seen last week, when Fatah demanded more attacks just a day before two separate attacks in Jerusalem that left three Jews murdered.